PLANTING: Can be grown from seed but it’s best to set out transplants or divisions in the spring. SPREAD: 8 to 12 inches. BLOOM/FRUIT: Purple, rose, yellow and white flowers. Heart shaped leaves. Mound forming to about 6 inches high. Makes lots of tiny seed. GROWTH HABITS/CULTURE: Low, spreading and aggressive. A very easy to grow plant for the naturalized garden. Grows best in well prepared soils with plenty of organic matter and plenty of moisture. HARVEST/STORAGE: Harvest the leaves when they are young and the leaves anytime during growing season. CULINARY USES: Purple syrup can be made from blossoms. Leaves and flowers are edible and in no way harmful. Foliage and flowers used for salads. MEDICINAL USES: Lots of vitamins Eespecially A&C. Antiseptic properties. Eat the flowers and leaves. The leaves are used for bruises, skin ulcers and other wounds. Martha Washington used the syrup to treat coughs and bronchitis in children according to Dr. Judy Griffin in Mother Nature’s Herbal. Here’s the recipe: Boil 3 pounds of sugar in 2 cups of water for 10 minutes. Remove any scum. Crush 1 pound of violet flowers in a mortar, add to syrup and cook until it loses color. Strain and bottle in glass when cool. LANDSCAPE USES: Low border plant. Good for garden fragrance. Good perennial border in the shade or semishade garden. OTHER USES: Violet oil used in perfume is a synthetic chemical - another reason I don’t like perfume. 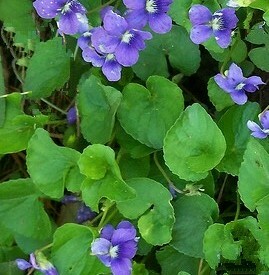 The only true violet oil is distilled from the leaves, is very expensive and has little scent. INSIGHT: Violets cousins, pansies and Johnny Jump Ups also have edible flowers. 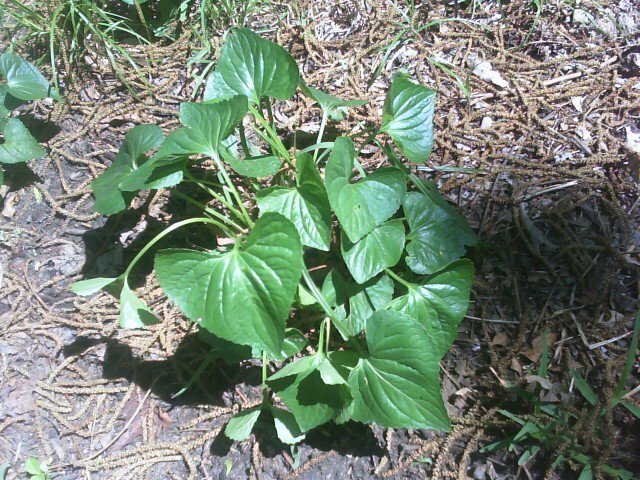 Many suggest that wild violets are weeds, but I disagree. The chemical boys would recommend spraying with 2,- 4 D but I encourage violets because they are pretty and edible. Use the flowers and young leaves in in salads and herb teas. Spot spraying with the vinegar-based herbicides will also work.